We are a family led initiative inspired by one young man’s taste in mustard sandwiches. We’ve had the original recipe for over 30 years and with a little personal taste and some customer recommendations, additional flavors have been inspired and created. Cian, the inspiration of the endeavour. Though he hasn’t had one in a while, his go to snack was a mustard sandwich, no fuss and no muss. Cian’s favourite flavours are Maple (served with a warm pretzel, especially on movie night!) and the Honey Hot with everything else. Cameron, steadfast and true. Cameron’s favourite meal is one he married into, the traditional English Sunday dinner featuring Roast Beef with Yorkshire Pudding. His preferred Cian’s Mustard flavour is Medium, his one exception is with a lighter meal like caesar salad, when the Hot variety adds some kick. Colin, where it all began. Grandfather, Englishman, Master Butcher, and Mustard Connoisseur. Colin had the recipe and made it special for friends and family. When Cameron tried it, he knew right away there was an opportunity to turn this fabulous recipe into a full fledge business. Well it took about eight years, but here we are today. If Colin had to name a favourite flavour it would be Maple or Honey, we will leave it up to you to decide! Colina, where it all comes together with variety and versatility for enjoyable eating. Colina wanted something different. After quite a lot of thought and experimentation, a beer mustard was developed. She didn’t stop there. As a mom, Colina wants the best for her family and wanted to elevate a honey mustard from the typical yellow goopy mess to one with impactful flavour. With feedback and a few trials, the honey mustard was created – one that can work with everything – sandwiches, meat pairings and mixed with a vinegar for a salad dressing. 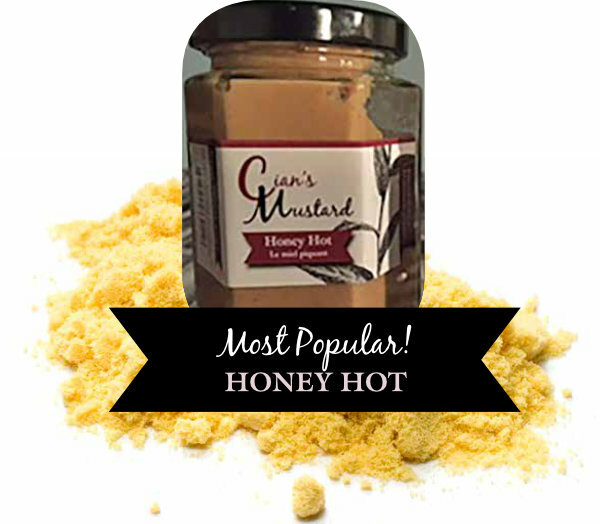 Then along came honey hot, her favourite creation, one that is best described as a natural sweet with an edge of heat. For every occasion, there is a mustard.